ARM and the U.S. Department of Energy. Adapted with permission. As far back as ancient Greek and Roman times, people built structures that created an indoor environment suited to growing plants throughout the year. This enabled the gardener to establish a measure of control over growing conditions and extend the growth period into the colder seasons of the year. In this manner, the gardener was better able to provide fresh fruits and vegetables when needed. Today these structures, called greenhouses, are usually made of glass or plastic, but they still allow us to maintain year-round greenery. There are similarities between a greenhouse and the Earth’s atmosphere. During the day, the sun’s rays shine on the Earth. Gases in the Earth’s atmosphere trap some of this energy created by the sun and help warm the planet. Without this “greenhouse effect,” the Earth would be too cold for life as we know it. But if the amount of greenhouse gases in the atmosphere increases, then more energy will be trapped, and the Earth will get warmer and warmer. The way that heated air behaves in a greenhouse is also different in some ways from heated air in the Earth’s atmosphere. For example, once the air in a greenhouse is heated, it has no way to escape. The Earth’s atmosphere is more complicated, as you can see in the illustration that shows the different ways solar energy interacts with the atmosphere. ARM and the U.S. Department of Energy. Make a hole near the top of the first plastic bottle and insert one thermometer. Use tape to hold the thermometer in place and prevent any air from escaping through the hole. Cut the second plastic bottle in half, as shown in the figure. 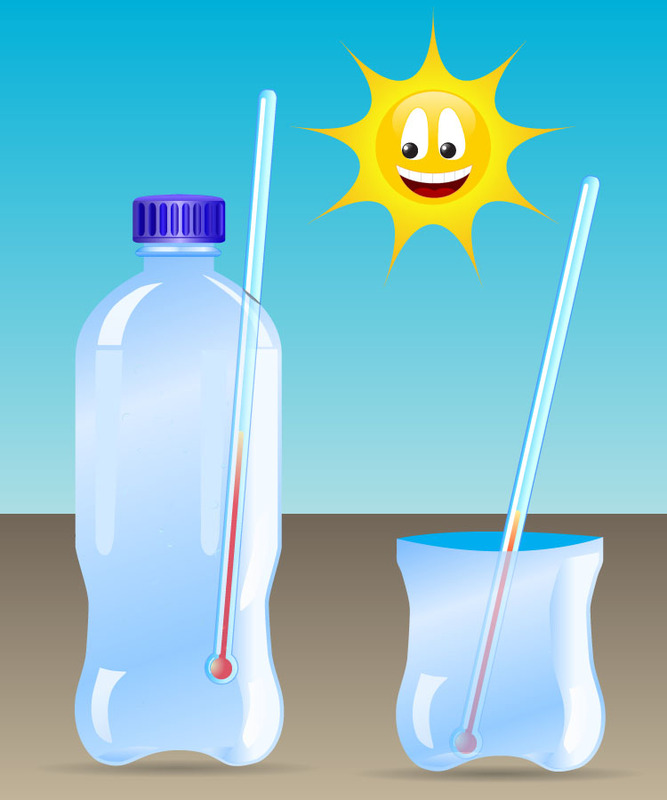 Place the second thermometer in the bottom half of the second plastic bottle. Make sure that the same amount of sunlight reaches both thermometers. Record the temperature values from both thermometers after 10 minutes or so. Take the temperature records again after another 10 minutes. Repeat the procedure at different times during the day or during different weather conditions. Discuss: Do both thermometers always record the same temperature? If the answer is “no” for the previous question, which one is higher? Can you explain why these two temperature records are not the same? What effect do different times of day or different weather conditions have on the temperature records? Can you give a similar example that demonstrates the greenhouse effect in our daily life? For more activities and information about climate science, along with lesson plans and resources for teachers, visit https://dis.arm.gov/education/teacher-tools/.